Charles City, Iowa – It’s cold, really cold. 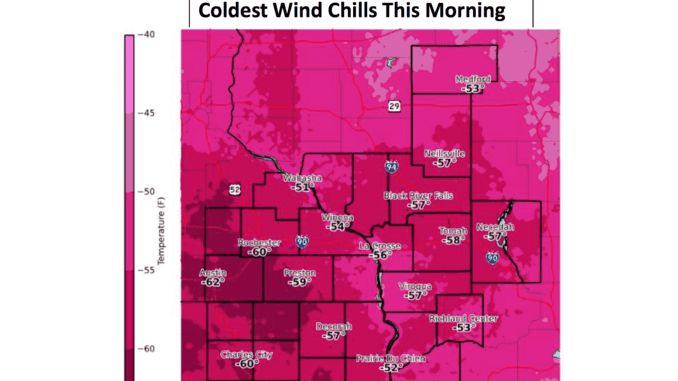 Temperatures dropped to 27 below zero and wind chill values dipped to -60 this morning. Forecasters say the arctic blast has the potential to be life-threatening. Not only is trying to stay warm an issue but so is using water. Charles City Water Superintendent Cory Spieker says the cold can impact residents while they do their day-to-day activities. A way to prevent frozen pipes is to run water through them all day. These temperatures are the coldest many have experienced. Former Iowa State Agronomist George Cummins says he’s never felt anything like this. The area has seen weather extremes over the last five years. From the onslaught of rain and snow to now record-low temperatures, Cummins says the cause for the weather cycles is up for debate.